Explore Brisbane's surroundings by going to Main Beach (Sea World Theme Park & Anthea Polson Art), Surfers Paradise (SkyPoint Climb, Infinity Attraction, & more) and Warner Bros. Movie World (in Oxenford). Pack the 14th (Sat) with family-friendly diversions at Dreamworld. Spend the 28th (Sat) exploring nature at Conondale National Park. And it doesn't end there: let little ones run wild at South Bank Parklands, explore the activities along The Brisbane River, look for all kinds of wild species at Lone Pine Koala Sanctuary, and get great views at Brisbane Botanic Gardens Mt. Coot-tha. 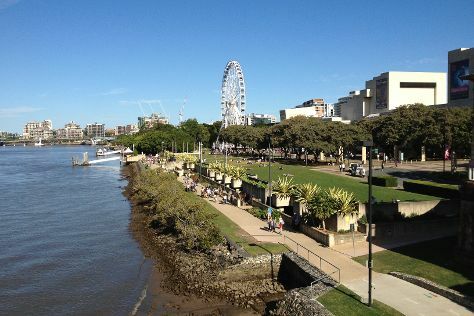 For ratings, photos, and other tourist information, read Brisbane attractions planner. If you are flying in from United Kingdom, the closest major airports are Brisbane International Airport and Gold Coast Airport. In September in Brisbane, expect temperatures between 28°C during the day and 15°C at night. Finish your sightseeing early on the 4th (Fri) to allow enough time to travel back home.